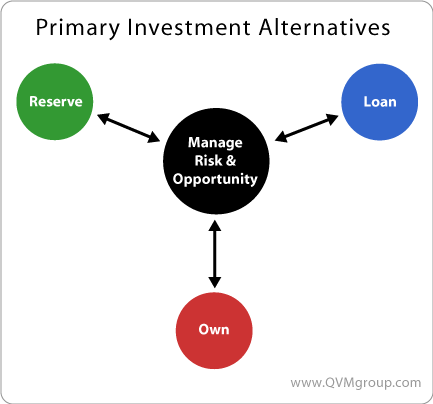 The single most important allocation decision is the balance between Owning, Loaning and Reserving. Owning stocks, property and commodities, versus Loaning money to banks or bond issuers, versus Reserving cash or near-cash will have more to do with your results than any other decision about investing. Probably 90% of your results will come from this basic choice, and only about 10% from all other decisions. These are the three primary asset classes. All other "classes" are just sub-categories. The strategic and long-term plan, as well as the tactical and short-term plan ultimately hinge on the choice of and movement between these three classes. Invest only in liquid securities with quantitatively attractive fundamentals, with a tilt toward dividend income growth stream. Your investment portfolio is not only about pursuit of realistic returns; it is also about risk management. Matching investment assets with capital expenditure needs, and matching investment cash flows with needed spending from investments are among the most important aspects of tailoring portfolio risk management for you as a unique investor. You shouldn't be in a stock model. You should be in personalized design. A balance between growth potential and loss potential is essential. The more mature your assets (the less ability to replace assets with future earnings) the more the balance should lean toward conservation and sustainability -- reducing loss potential at the expense of growth potential. The less mature the your assets (the more the ability to replace assets with future earnings), the more the balance should lean toward potential growth with the associated assumption of more risk. Avoid inadvertent risk concentration by seeking minimally correlated assets. 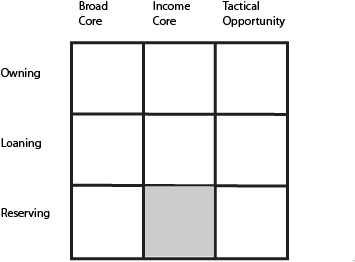 Tactical Opportunity (lowest allocation: up to 25%). To assure that a single class has the potential to contribute meaningfully to portfolio returns; the minimum weight should be 5% per class. To minimize exposure to security issue selection risk, no active management fund or non-core index fund should have a weight more than 5% (core, broad market index funds may be weighted to the extent of the asset class weight). No individual stock or bond should be weighted more than 1.5 to 2%. Manage to target asset category weights, but do so tactically. Shift assets between categories to adjust weights when they get substantially out of line, not just on specified calendar dates. Be willing to "store" assets for a category in cash during significant downtrends, and then restore the risk position with that cash at the target weight when an up trend recurs. A simple benchmark consisting of some published index or combination of indexes should be selected against which to measure the management of the actual portfolio.